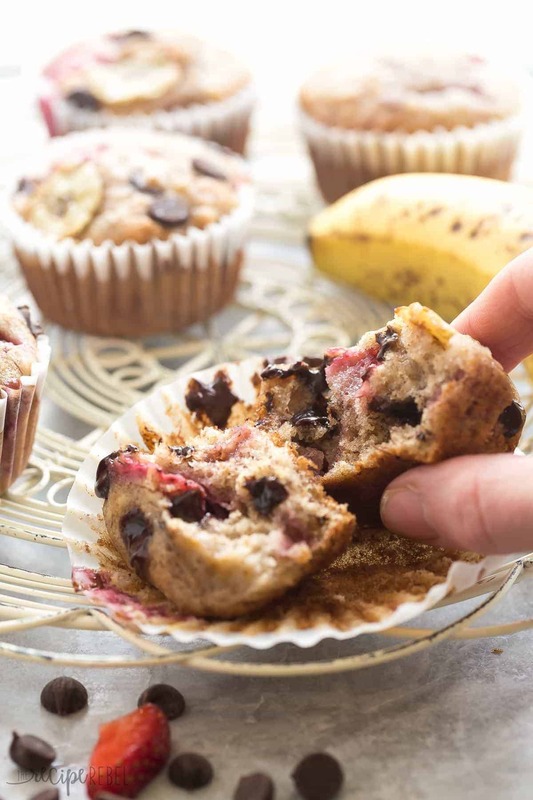 These Chocolate Chip Banana Muffins are the best — so moist but made healthier with whole wheat flour, yogurt and loaded with fresh strawberries! First of all, I don’t normally post on Tuesdays. Second, I actually just whipped up this recipe over the weekend. That’s right, just a few days ago. If you don’t know by now, I am an obsessive planner and workaholic. Which means that I am normally making and photographing recipes for a few weeks (sometimes more than a few…) down the road. I am actually not a spontaneous person. But I picked 4 gallons of fresh strawberries last week and it felt wrong to just not make anything with them. My kids — one and four — are always ravenous and muffins are one of their favorites! I thought it was time to add a strawberry twist to my favorite Banana Chocolate Chip Muffin recipe. I have been making these Double Chocolate Banana Bran Muffins on repeat for what seems like the last 6 months — they are super healthy but they taste so fudgy, and we all love them! But it was time for a little change. The fresh strawberries in these muffin add such a great burst of flavor, and I am a BIG fan of fruit and chocolate (aren’t you??). The recipe makes a good number (I got 30), so that you can store some in the freezer for sometime down the road, and they make great snacks for packing on summer road trips. The rest of my 4 gallons of strawberries? I’m not telling you how many I ate just straight out of the pail. The muffins usually come out pretty easily, but if you have problems with them sticking I have a bunch of these silicone muffin liners that I LOVE — nothing sticks to them and you can wash and reuse! Often when I’m baking for the kiddos I like to bake these in my mini muffin pan — it makes them the perfect snack size so that there’s no waste! 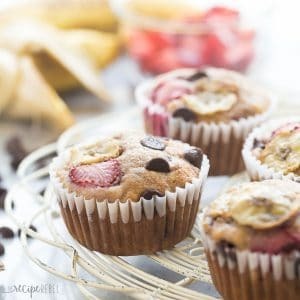 These Chocolate Chip Banana Muffins are the best -- so moist but made healthier with whole wheat flour, yogurt and loaded with fresh strawberries! To a large bowl add bananas, sugar, oil, yogurt, eggs and vanilla. Whisk until combined (I use the whisk to mash my bananas as I'm doing this). Using a whisk or spatula, gently stir in dry ingredients (flours, salt, baking powder, baking soda, cinnamon, nutmeg), ensuring even distribution without overmixing. Fold in chocolate chips and fresh strawberries. Fill liners with batter, about ¾ full. Bake for 18-20 minutes, until golden and a toothpick comes out dry or with moist crumbs. Store in the fridge for up to 5 days or in the freezer for up to 6 months. To a large bowl add bananas, sugar, oil, yogurt, eggs and vanilla. Whisk until combined (I use the whisk to mash my bananas as I’m doing this). Help i have the darker pans and keep burning my muffins. I only cook them for 20 minutes instead of 30. Should i turn down the heat and will they still get done if i do. Welcome to the dark side (being spontaneous)! Haha someday I hope to get my act together ahead of time. 🙂 Love a healthier sweet treat that is A-OK for enjoying in the morning. Look at you being all spontaneous… ha ha I’m sorry…I had to tease you 😉 These look SO delicious. I’m so happy that berry season is finally here! I adoooooore these muffins, Ashley! The strawberries were such a delicious addition. I want to take a big bite 😀 I can totally see why you needed to post them ASAP! I had to do it before alllllllll the berries are gone! Only about one more week here 🙁 I need to get some more! You can’t go wrong with the combination of strawberry and chocolate! I love this fun twist on banana muffins and will definitely need to make a batch of these soon. My husband eats sweets like it’s his job. Can’t. wait to “fool” him with this healthier version of these muffins. Thanks Ashley. Haha! We like our sweets here too! I hope he likes them! These look so wonderful! And it makes them more fun since it was a spontaneous recipe :). Can’t wait to try them! My kids are always begging for muffins and would love the strawberry and banana combo! We are going strawberry picking next weekend and I’m definitely saving some to make a batch of these delicious muffins! These look delicious! Definitely pinning them for later! I’m so glad you shared this recipe! 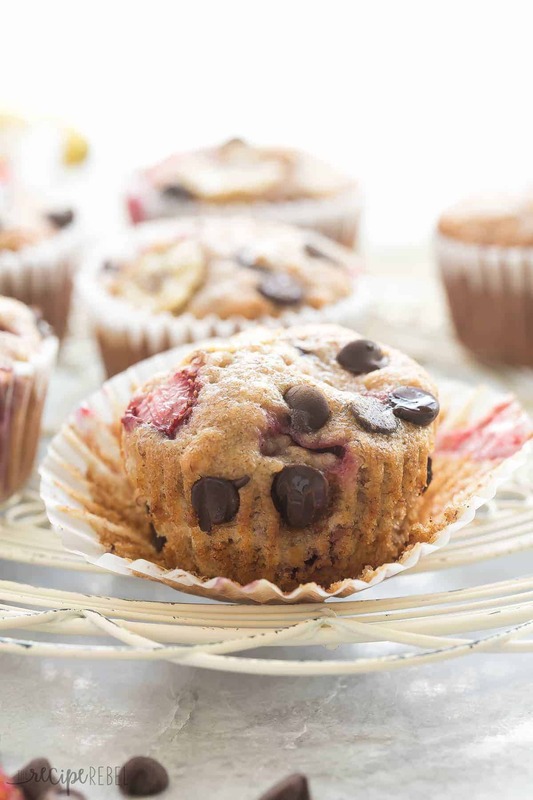 These muffins look so moist and packed with strawberry banana flavor. Also, isn’t strawberry picking the best? Hi Ashley! I make banana chocolate chip muffins, but the addition of strawberries takes muffins to another level! I sub in some whole wheat flour in my baking whenever possible, not necessarily because it’s healthier, I just like the taste! Muffins make great snacks any time of day or night. Yes, I love using whole wheat flour in baking! I rarely use all purpose anymore. And snacks are something we are always in need of here! These girls can snack like it’s their job! Lol. Thanks Marcie! I actually got it in SLC! I miss all of you ladies! Nothing like strawberry season right?? I’m feeling the need to make like a TRIPLE batch of these gorgeous muffins and pack ’em all away in my freezer for whenever a gotta-have-it-NOW muffin craving hits. Can’t beat a strawberry/choc/banana combo!! My kids feel the same way! Lol. They seem to always be in a gotta-have-a-muffin-NOW kind of mood! Strawberry banana muffins are a favorite of mine! I made a similar version a few months back and am hooked. I love the addition of chocolate chips in here. Sometimes you just gotta share the good stuff right away! Yes strawberry and banana is a classic combo! Thanks Gayle!